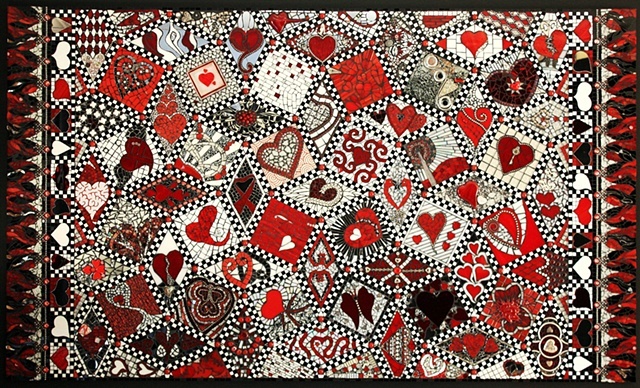 Each heart mosaic was composed on a mesh background in the individual artists’ studio and shipped to Michigan where it was then incorporated into the larger mural. The multiple and varied pieces were pulled together utilizing an intricate and detailed background. Each of the pieces within Heartistry was designed to represent hearts. In each design there may be one heart, many hearts, or just a portion of a heart. Designs could be bold, busy, swirly, clean or simple, but only three colors could be used: red, white, and silver. While there was no requirement to use all three colors—each piece was required to have some red in it. stained glass, vitreous tile, tempered glass, mirror, dichroic glass, fused glass, plate glass, ceramic shapes, paper, flatware, metal key, jewelry: earrings, bracelet, pendants, charms, glass marbles, millefiori, polymer clay, ballchain, bb pellets, clockwork gears, and beads of coral, metal, glass, and onyx.